SNES Ultimate Mortal Kombat 3 (USA) "playaround" in 30:28.38 by SDR, Thevlackdemonn2294 & Dark Noob. Ultimate Mortal Kombat 3 is one of the most diverse games of the series in terms of characters and play modes. The authors take advantage of this and deliver an exceptional playaround movie. Bugs, easter eggs and impossible combos are shown off at a breathtaking pace. The movie features a mix of 1 and 2 player play for added variety. This movie is longer than its predecessor by around 14 minutes, showing off more glitches. 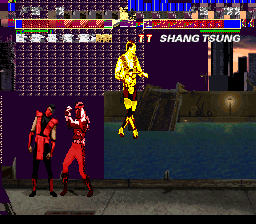 It also uses a cheat that enables pausing in order to show off even more glitches.